Simon Griffiths – Sculpture Click an image to see a larger image. …draws his inspiration as well as his great respect and passion for the natural world. He can often be seen, with his sketching equipment and camera, quietly observing the birdlife. 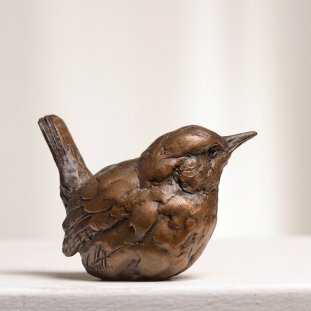 Working closely with local bird sanctuaries has allowed him to carefully study the form, structure and character of birds that he then translates into his sculptures. His work primarily stems from direct observation of the subject being portrayed. The stylistic and constructional considerations are secondary to portraying the subject as honestly as possible. 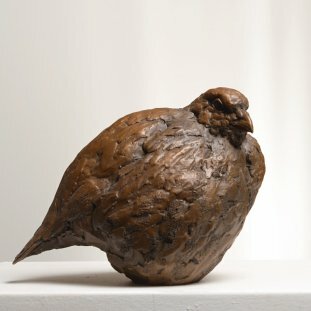 He seeks to capture and portray that sense of awareness that is present in all living things and likes to think that every one of his sculptures has some of the soul of the animal within it. 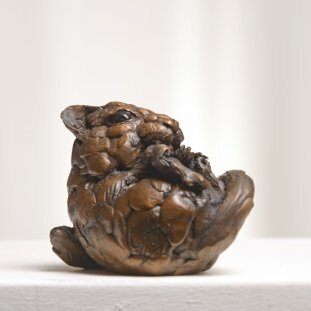 The work is constructed in crank clay around an armature., modelled as fully as possible by hand – with tools used only to accentuate certain lines. When the clay is firm the armature is removed and the piece is hollowed to an even thickness. Once bisque fired the work undergoes several more firings with successive layers of oxides, stains and under glazes to build up the required effects and depth of colour. All sculptures are fired to stoneware temperatures. Most of the larger sculptures are attached to a piece of wood or a post and a base and joined as a whole.